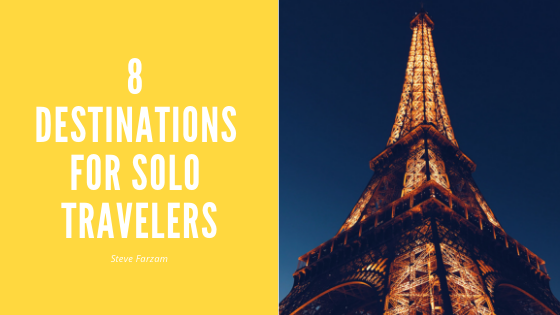 There are many destinations in the world for those who are traveling solo for the first time. These destinations include large cities, remote villages, and beaches on four continents. Travelers can see a panoramic view of New York City before they start exploring from the Top of the Rock Observation Deck at Rockefeller Center. Central Park is one of the tourist destinations visible from the deck. Solo travelers can relax on the park’s lawns or explore its gardens. People who enjoy seeing panoramic views of large cities can see Paris spread out beneath them from the top of the Eiffel Tower. Those who want to get a closer look at Paris can rent a bicycle to explore the city. Exploring Berlin is an excellent activity for solo travelers who are interested in history. Exhibits at the immersive DDR Museum document daily life in East Germany. The Berlin Story Museum tells the story of 800 years of Berlin’s history. Solo travelers who are taking a trip to get away from crowded cities will appreciate Ireland’s remote villages. A drive through County Donegal will take visitors near remote villages and hidden beaches. Those who are in the mood for some company can visit one of Donegal’s many pubs. People who want a destination with a variety of activities will enjoy Lake Garda in the northern part of Italy. Visitors can wander through charming towns, stroll along beaches or visit historic sites. There are several train stations in the Lake Garda area where travelers can catch the Trenitalia to major cities in other parts of the country. The scenery in Thailand includes beaches, jungles, and mountains; the perfect destination for solo travelers that are seeking a variety of landscapes. The country has numerous modes of transportation. Travelers who enjoy beaches and mountains will find them in Australia. There are numerous beaches in the eastern part of the country along the Gold Coast. The Australian Alps have places for horseback riding, hiking and mountain biking. New Zealand is another beautiful place to visit for solo travelers who want to spend some time in the mountains. Fiordland National Park on the country’s South Island has snow-covered peaks, glaciers, and waterfalls. Volcanic peaks, farmland and the coast of the Tasman Sea are visible from the Northern Explorer. This train travels between Auckland and Wellington on the North Island.